Hello, today I have a very "pretty" card to share with you. 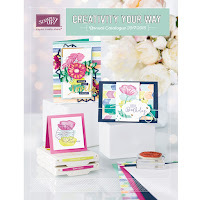 It's featuring one of my favourites, the Pretty Petals Designer Series Paper Stacks. I absolutely love every pattern in this fab paper stack, but I really wanted to use the multi-coloured butterfly pages to be paired with the Garden in Bloom stamp set. [Watermelon Wonder, Pacific Point, Mint Macaron and Old Olive]. That's a great way to choose your colours, just match them with your designer series paper! The front is pretty... then you open the card and surprise lots more fun! I stamped some of the largest flower image and the second smallest butterfly, plus that adorable little bee. Isn't he sweet?! This stamp set is for two-step stamping, which is a great time saver since there is no colouring involved. So I had the extra time to fussy cut them all out. I added some of the lovely sentiments to the front, and inside with a couple of the tiniest butterfly to the front before punching the entire sentiment out and adding to my front panel. Here's a view of the top of the card - it stands up nicely for displaying. Such a sweet stamp set, with lots of possibilities.